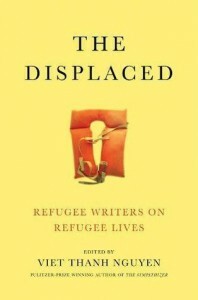 The Displaced - Excellent Anthology of Refugee Writers - "So it goes." Viet Thanh Nguyen serves as editor for a short but impactful collection of essays about refugees and the refugee experience. I read a lot about immigration. I'm not entirely unaware that many of these stories are actually about refugees, but it's interesting that people often morph themselves into "immigrants," when in fact most of our families came from a refugee experience at some point. My father's family came in dribs and drabs to both coasts (and ended up with numerous spellings of our last name) because of the potato famine in Ireland. Nobody calls our family "refugees" but they were. It was just an easier time to be that when they showed up and pretended to have degrees in things like medicine... (true, but much too long a, story) So, given all of that, it's a willful political act for these writers to reclaim the identity of refugee -- especially given their successes and acceptance now in their new homes. The tragedy is how these new homes forced people in a variety of ways to deny their original national identities. Some are more obvious than others, but all carry an almost unexplainable burden to the individuals, and I'm pretty sure to their new countries as well. Many, but not all, of the writers are now living in the US, and all of them are successful, educated, prize-winning, feted authors. Interesting how willing countries are to claim these refugees now that they have proven their worth. They've come from all over the world and they have personal experiences that frequently left me tearing up. The overall effect is rather devastating. I'm not going to review each piece, because they are all worth reading more than once.